If there’s two things we all love, it’s gadgets and eating. And while there are numerous Groupon coupons out there for delicious ways to get food in our gadget loving mouth’s, cooking these for yourself is often the dread of a gadget lover for its perceived lack of technological inclusion. If these are your thoughts, have we got some information for you! Open up a recipe book and the first thing that you will notice is the need to measure and apportion your ingredients. While this once relied on traditional scales and measuring cups, technology has made its way in. Take smart scales, for example. With these handy gadgets you are simply presented with a blank slab to place your ingredients on – however connect your smart phone and suddenly you’re presented with not only the weight, but detection of what you’re weighing including information on its health benefits and freshness. One of my favorites, smart pans can now send information to your smartphone or tablet that not only tells you when the pan is at the right temperature, but also keep you updated on the cooking status of your food. If you’re wanting to take this one step further, there are connected crock pots available for you to put your ingredients in early in the morning before work and start the cooking process throughout the day from the comfort of your computer’s web browser or even your smartphone. Not to be left out, along with the increased functionality and capabilities of your regular smartphone, apps are able to do more than ever. Not sure if the eggs in your refrigerator are still fresh? Whip out your phone, take a picture and let the app tell you what’s inside. Have a fridge or pantry full of ingredients but you don’t know how to combine them? Whip out your smartphone, snap some quick pictures of what you have and watch the delicious recipe ideas roll on in! These apps are also able to help you use other ingredients to substitute if your pantry is looking a little bare. 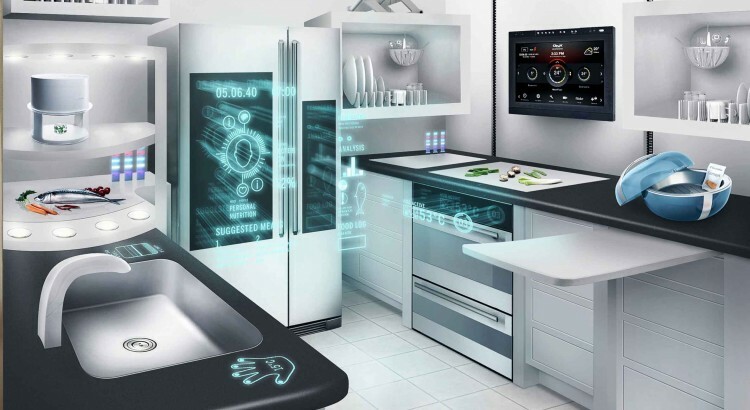 Getting gadgets into your kitchen and connected to your smartphone doesn’t require a lot of know-how, and often isn’t as expensive as you may think. Take a look around your kitchen and find the most used items – once you’ve got that list, shop around and see how you can upgrade them to smart or connected devices to get you more interested in the cooking side of eating.